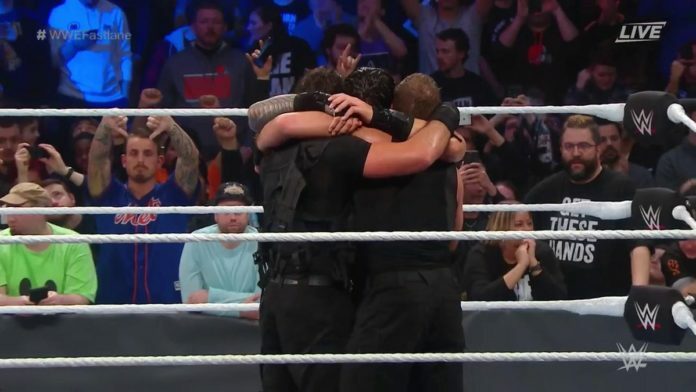 WWE has released some footage of The Shield’s emotional goodbye at the most recent pay-per-view event, Fastlane. Former WWE Universal Champion Roman Reigns got the group back together in order to compete in his first match back in several months after he had announced that his battle with leukemia is in remission. He teamed up with Dean Ambrose and Seth Rollins to beat Drew McIntyre, Baron Corbin, and Bobby Lashley in a six-man tag team match. This contest served as the headliner of this show that took place from the Quicken Loans Arena in Cleveland, Ohio on the WWE Network earlier this month. WWE hyped this match as the final match for the group leading up to it. The reason for that is due to WWE confirming that Ambrose would be departing from the WWE at the end of April as he has decided to not sign a new contract with the company. WWE has yet to announce who Ambrose and Reigns will face at WrestleMania 35. The company has confirmed that Rollins will challenge WWE Universal Champion Brock Lesnar. WWE presents the WrestleMania 35 pay-per-view event on Sunday, April 7, 2019 in East Rutherford, NJ at MetLife Stadium that will air on the WWE Network.